Cuppa and Chat continues to go from strength to strength! We are getting a really good group of regulars now who all have an interesting story or two to tell. It has been wonderful to see people over a period of time gradually come out of their shell and talk more especially about things that might be bothering them. We also continue to get people who just happen to wander into the church and are delighted at the thought of a free cup of tea or coffee. We have started working more closely with West Midlands police to run an informal monthly police surgery where a local policewoman called Beth comes along and chats to people that attend to see if there are ways that she can provide advice and support to people. This has been a new initiative piloted by the police in order to build relationships with more vulnerable people in a safe and non threatening environment. We look forward to seeing how that develops. We have also been working In partnership with The Community Navigators Scheme which involves a worker called Angie coming along to Cuppa and Chat each week and offering practical support to people that might need it eg. Help with benefits, accommodation, befriending services etc. On average we have been able to refer 2-3 people to Angie every week which has meant a great deal to some of the people that are attending and are in very real need of help and support. We are very grateful to Angie for her time and expertise. I must also give a shout out to my very dedicated and wonderful team of volunteers who turn up every week to care for and support the people that we get along on a Monday morning. I definitely couldn’t do it without them! 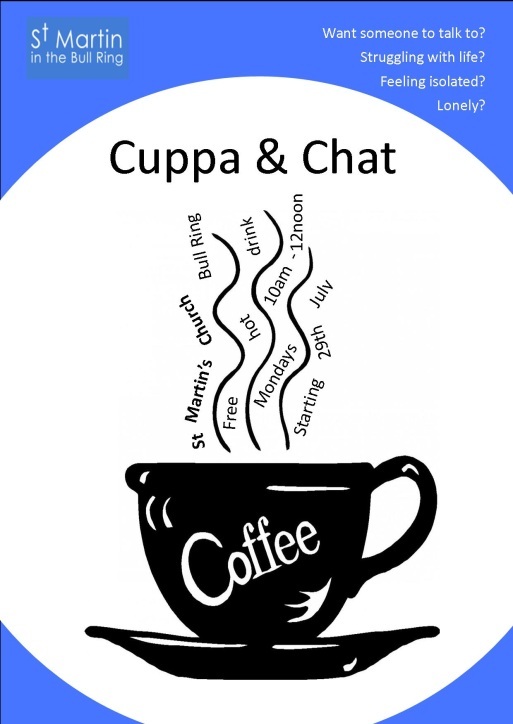 As always if you, or someone you know would like a free hot drink and someone to talk to then please pop along to St Martins Church on Monday Morning between 10-12pm, we would love to see you there! For any more information about this or any other activities that are run at St Martins, please contact the office on 0121 600 6020 or use the contact form at the bottom of this page.